In a crowded pool, it can be difficult to make a splash. But that’s precisely the position that Pittsburgh Penguins forward Scott Wilson finds himself in. Wilson is on the road to recovery after an injury derailed his 2015-16 campaign. What remains to be seen, is if that road leads him back into the Penguins lineup. Now fully healed from that ankle injury that caused him to miss the final three months of last season, Wilson is ready to claim what is rightfully his. 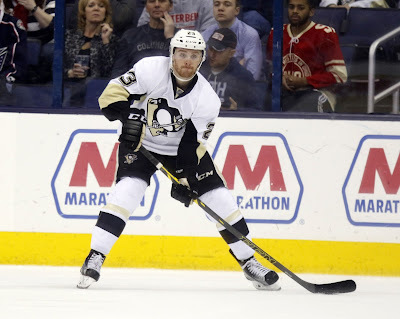 On the eve of #Penguins training camp, the player who takes the next step in his development will be Scott Wilson. A forgotten man during the Penguins Stanley Cup run, Wilson was actually one of the first Penguins tapped for a call-up from Wilkes-Barre. At the time of his call-up, he led the American Hockey League with 22 goals. Wilson showed he belonged and displayed a developing adoring touch with goals in three straight games. “I started to feel really good, that was probably the hardest part was being on a little bit of a run there, getting some goals and playing really well,” he continued. But Wilson isn’t the only young forward looking for a permanent home in the Penguins lineup. Despite signing a one-way contract, it doesn’t come with the guarantee of a roster spot. Connor Sheary, Tom Kuhnhackl and Brian Rust are all vying for ice time as well. Coming off of a post-season where each made notable contributions, they’ve become intricate pieces to the Penguins puzzle. A puzzle that appeared to have many holes just one year ago. Aside from watching his teammates contribute to a Stanley Cup run, Wilson may actually benefit from his injury in one key way his teammates won't: rest. Now skating for several months, the 5’11” native of Oakville, Ontario revealed to the Pittsburgh Post Gazette just how close he was to returning to the lineup during that run. While he's yet to score in 20:36 of ice time against the Detroit Red Wings, he did tally once in a scrimmage. With month's of rest and rehab behind him, he's keen on picking up where he left off. "I think it’s tough when you’re watching; you always want to be out there. You know, injuries are the worst part of this game so anytime you’re watching form above it’s tough" Wilson said. "I haven’t felt this good I my career so I’m just excited to get going.